It is probably wishful thinking but there is a remote possibility that Sunday Wilshin could fit the bill. A Forgotten name now, she was a prominent young actress at the time and was part, if not of Elvira’s immediate circle then, of the glamorous world half way between the stage and high society. She had had a much higher profile in 1932 than Worthington or Waring, and therefore would have had greater reason to avoid the unwelcome spotlight that the shooting would have turned on her. She famously features in recent Bright Young reminiscences as simply “a girl called Sunday Wilshin” who was assaulted by Brenda Dean Paul at Arthur Jeffress’ ” Red and White Party”. (see https://elvirabarney.wordpress.com/2011/10/26/the-red-and-white-party/ ). This does her something of an injustice. Wilshin’s connection with Elvira Barney herself is impossible to prove and may well have been non-existent. Had she not had a clump of her hair pulled out by Brenda Dean Paul I would not even be speculating about her. If we only knew what the fight was about we might be able to make a few reasonable inferences. Yet, there are certain traits that she shares with elements of the Mews cocktail crowd. 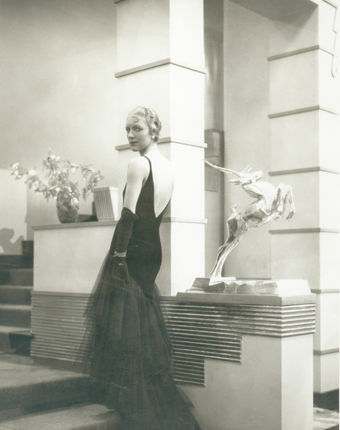 An actress, almost definitely lesbian or bisexual, well known on the night-club and party circuit and with connections to high society (both Lady Violet Paget and Barbara Cartland designed dresses for her), if she didn’t exactly move in the same orbit she would at least have been known to Mrs.Barney. By the 1930s Wilshin was a familiar face on the British screen as well as on stage (she was in Hitchcock’s Champagne in 1928 but her film career only really took off with the advent of talkies). However, like Streatfield, she had ambitions above and beyond looking decorative. In 1938 she turned her attention to radio drama and began a long association with the BBC, working firstly as an actress then as a producer. She is best known for her work with the overseas service, making documentaries and a series of interviews with writers and artists. She replaced George Orwell as the BBC’s specialist on India and was responsible for the corporation’s output during the sensitive run-up to Independence and Partition. Some of Orwell’s last correspondence is to Wilshin – she was trying to persuade him to contribute a talk on poetry. Popular with her staff, she was fondly, if a little patronisingly, remembered by Hallam Tennyson (another Indian specialist and an intriguing character in his own right). “Our boss was the delightfully dotty Sunday Wilshin. Sunday was one of the few women executives I have met who enjoyed her ‘feminine’ qualities and who made use of them in her work “. He noted her continued preference for a kiss-curl hairstyle and felt she was still a Pre-War starlet at heart. Apart from her radio work, she wrote books and, with Selene, edited and proof-read the work of others.She also made the occasional foray into television – presenting “Asian Club” in 1955, surely the first such venture in the West. Where did her interest in India come from? Funnily enough, this question might lead back to the party-world of the early thirties. By1932 Selene Moxon had tired of the social whirl of London. In July, just as Elvira was winning her case, Selene and Sunday acquired a cottage in Little Saling in Essex. They became became part of the Gurdjieff/Fourth Way study group set up by Maurice Nicholl, two miles away, at Lakes Farm, just north of Braintree. The mysticism and search for spiritual peace that characterised these communities had a particular attraction then, as it did in the 1960s, to those seeking a way out of addiction and many more who were just no longer fulfilled by the endless round of late-night excesses. Tantalisingly, a year later Denys Skeffington Smyth moved out of Mayfair to Great Bumpstead, less than ten miles away. Wilshin died in 1991. Although I doubt she has anything more than a tenuous link with the Barney affair, she epitomises the spirit of the age and, as a symbol of female modernity and the struggle for independence and self-determination, she is the equal of many better known young women of her time.I like her and think she is worthy of more biographical research. 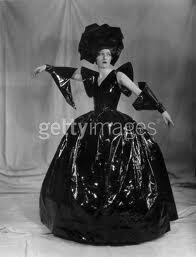 One of Sunday’s few fashion gaffes – as “Coal” – designed by Barbara Cartland – and what looks like an early use of the bin liner, to me. I worked with Sunday as her secretary at the BBC in the 1960’s and saw her not long before she died. I’d love to know more about her. Who was Elvira? Hi – you worked with her? How wonderful.What was she like as a person, if you don’t mind my asking? I’m afraid I don’t know much more of her than the information I posted in the article. You probably have more knowledge of her life and career than I do. However,If I come across more material I’ll post it or e-mail you.She certainly seems deserving of greater attention. Though Miss Moxon was around, Sunday’s close friend was Rosemary Sands, another BBC producer.